By Dan Ambrose: With his recent victory over champion WBC light heavyweight champion Jean Pascal last May, 46-year-old Bernard Hopkins (52-5-2, 32 KO’s) is riding high right now with many boxing fans seeing him all but invincible as he gets ready for his first defense of his World Boxing Council title against challenger Chad Dawson (30-1, 17 KO’s). Dawson’s star has dimmed since his loss to Pascal last year in August with a lot of boxing fans thinking that Dawson was exposed in that fight and that he’s past his prime. However, Dawson has a new trainer now with Emanuel Steward and is an even better boxer than he was in the past. This is going to be a very tough fight for Hopkins to win if Dawson stays disciplined and fights like he did in his first fight under Steward’s helm in Dawson’s 12 round decision win over Adrian Diaconu. Dawson used his jab and combinations in that fight to get the win and make a very good Diaconu look overmatched. There’s no secret to what Hopkins will be trying to do with Dawson. Hopkins likes to try and get off first by diving forward, and whether he lands or misses, he’s usually falling into his opponents, where he then likes to turn the fight into a wrestling, clinch-fest. It’s Dawson’s job to smack Hopkins while he’s falling forward and avoid his wrestling. 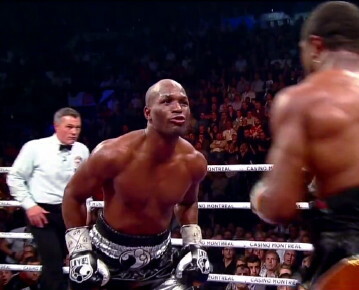 It’s not easy to do, because Hopkins tends to stick on his opponents once he’s fallen into them. However, Dawson’s speed and boxing ability will give Hopkins problems when he tries to turn the fight into a punch and grab wrestling match. WBA bantamweight champion Anselmo Moreno (31-1-1, 11 KO’s) will be defending his title against challenger Eric Morel (44-2, 22 KO’s). Moreno could have taken on WBC/WBO bantamweight champion Nonito Donaire in a bigger paying bout, but Moreno decided to take the somewhat easier fight against Morel. This could end up hurting Moreno if he gets beaten. He’ll get less money and won’t have the Donaire fight to fall back on. Antonio DeMarco (25-2-1, 18 KO’s) faces Jorge Linares (31-1, 20 KO’s) for vacant WBC lightweight title. Linares should win this fight. Danny Garcia (21-0, 14 KO’s) vs. Kendall Holt (27-4, 15 KO’s) for the IBF light welterweight title eliminator.